in the 1970s, my access to information and entertainment was limited to a handful of media outlets — two television channels, one newspaper, and a handful of radio stations. Given that airtime and column inches were scarce and expensive resources, it’s not surprising that I had so few choices. Fast forward a few decades, and the situation could not be more different. There’s been an unprecedented explosion of content. On YouTube alone 4 billion videos are viewed every day, and 60 hours of video are uploaded every minute. My family has endless choices of what to watch, listen to, play, and read. This is obviously an era of major change, and, rightly, many questions are being asked about how the media sector is evolving and what the future holds for Australian consumers and content creators. These are important questions that go beyond mere economics. We’re talking about the building blocks of our culture and identity. A strong, diverse media sector is central to that. Wanting to better understand the current landscape, we commissioned the Boston Consulting Group to prepare an independent, fact-based report — which we believe is the first of its kind in the world -— on the impact of Internet media on consumers, artists, and the industry in Australia. Australians like the new media world, where their access to, and choice of, media has never been greater. We’re consuming more media than ever before, and we’re happier with both the quantity and quality of material available. Australians love Australian content. We are choosing to watch Australian-made content, despite the fact that we can easily watch content from anywhere in the world. Overseas they love Australian content too. Australian content performs so well overseas that we have a trade surplus: overseas they watch more hours of Australian-made online video than Australians watch of overseas-made online video. This dynamic new media world is creating tremendous opportunities for new and existing media businesses. According to the report, the media industry will grow over the next four years, with revenue projected to rise to $29.1 billion and 15,000 new jobs created. The Internet will be a key driver of that growth. Furthermore, BCG calculates that new media is generating a consumer surplus of $24 billion — this is the value that Australian consumers believe they’re deriving from new media above what they already pay. As new content, new distribution platforms, and new monetization mechanisms come together, there’s a lot of opportunity ahead. Existing companies stand to gain, but we’re also seeing a generation of new artists and entrepreneurs emerge here in Australia, from Brisbane games developer Halfbrick to Perth’s Nick Bertke, alias POGO, whose remixes on YouTube earned him work with Disney and Pixar, as well as an exhibition at the Guggenheim in New York. It’s clear that Australian consumers, media businesses, and content creators are all benefiting from the Internet, but just as exciting is that Australian content — and the Australian culture and identity — is staking out an even stronger place in the world. Go here to read more and download the full report. As I was growing up in Newcastle in the 1970s, my access to information and entertainment was limited to a handful of media outlets — two television channels, one newspaper, and a handful of radio stations. Given that airtime and column inches were scarce and expensive resources, it’s not surprising that I had so few choices. While on holidays, a tourist uses her smartphone to find a dive shop that provides snorkel tours in Queensland. She searches, finds your site, and clicks through, prepared to research and reserve a package, or find your store nearby and arrange one from there. But, after she clicks to your site she runs into trouble - it doesn't load fully, and she spends more time zooming-in and squinting than she does studying your snorkel packages! Frustrated, she gives up and looks for another shop. You lose a potential customer. This happens hundreds, even thousands of times every day in Australia, because 4 out of 5 businesses’ websites don’t work well on smartphones. With half the population of Australia now owning a smartphone, the most important thing you can do to grow your business using the mobile web is to create a mobile-friendly website: a website designed specifically for mobile users and mobile devices. It should be fast to load and easy to use—no pinching and zooming required. To find out whether you’re ready to Go Mo, visit www.howtogomo.com/au. 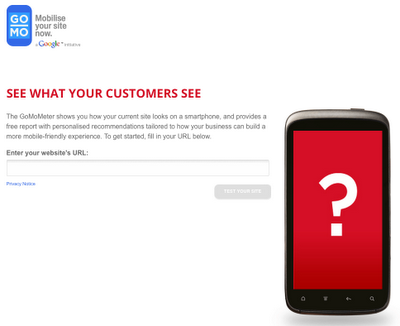 Enter your website’s URL to see how your site performs on mobile phones with the GoMoMeter. The GoMoMeter will analyse your site and give you customised recommendations on how to make your site more mobile-friendly. You can even download a free customised report! Every day more and more of your customers are looking for you using their mobile devices, and if your site isn’t mobile-friendly chances are you’re missing out. So don’t shut the door on mobile: visit www.howtogomo.com/au and take the first steps towards going mobile, today. From Gayglers to Greyglers to VetNet (that’s the Google Veterans Network), Google has a whole range of interest groups in our company because diversity matters to us and our users. Representing different perspectives and ideas is fundamental to our mission to organise the world’s information and make it universally accessible and useful. 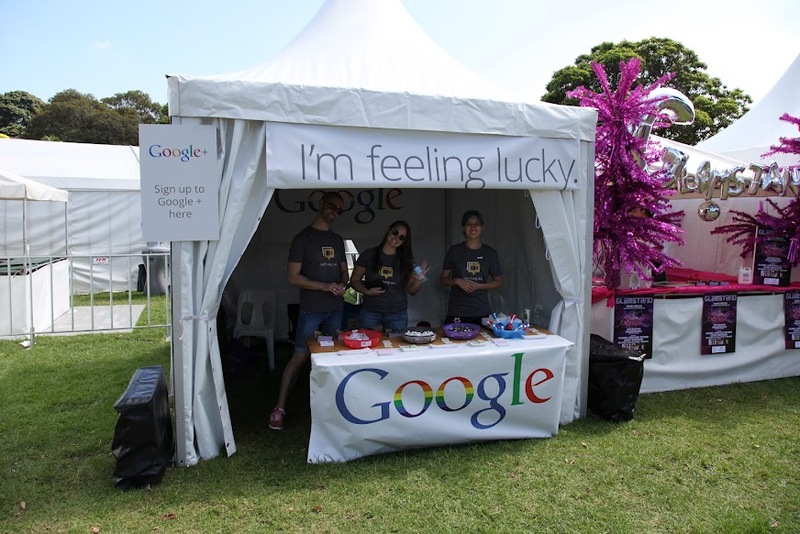 Here in Australia, we’re proud to support +Sydney Mardi Gras for the second year. Tomorrow night we’ll join half a million people on the streets of Sydney with our very own float. Our hundred dancing Gayglers will march down the famous Oxford Street strip to show our support for the LGBT community and you’ll be able to join us via a Google+ Hangout (add +Google Australia to your circles to see details on how to take part). 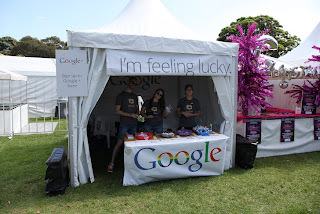 Last month, the Google team also was out at Fair Day, attended by 70,000 people, to talk about diversity in the workplace. As part of our partnership with the Mardi Gras Festival, we also recently hosted two Queer Thinking seminars on Activism in the Internet Age and Queer Careers. Experts joined us on stage and via a Google+ Hangout to talk about how the web has changed campaigning for a cause and what it means to be a LGBT business leader. Thank you to the speakers who participated -- Alex Greenwich from Australian Marriage Equality, Aaron Hulse of GetUp! Australia (who were behind the It's Time campaign that went viral), Alan Seah and Paerin Choa from Pink Dot Singapore, Senator Louise Pratt, Washington D.C based Bob Witeck, Feyi Akindoyani of Kreab Gavin Anderson, and Megan Smith, Google’s VP of Business Development. You can see highlights from the Hangout here. Verne Smith, Gayglers Sydney lead, Google Australia and New Zealand. And because we’re making these changes, over time we’ll be able to improve our products in ways that help our users get the most from the web. While we’ve undertaken the most extensive user education campaign in our history to explain the coming changes, we know there has been a fair amount of chatter and confusion. So in the future, if you do frequent searches for Jamie Oliver, we could recommend Jamie Oliver videos when you’re looking for recipes on YouTube—or we might suggest ads for his cookbooks when you’re on other Google properties. Our privacy controls aren’t changing. The new policy doesn’t change any existing privacy settings or how any personal information is shared outside of Google. We aren’t collecting any new or additional information about users. We won’t be selling your personal data. And we will continue to employ industry-leading security to keep your information safe. If you don’t think information sharing will improve your experience, you can use our privacy tools to do things like edit or turn off your search history and YouTube history, control the way Google tailors ads to your interests and browse the web “incognito” using Chrome. You can use services like Search, Maps and YouTube if you are not signed in. You can even separate your information into different accounts, since we don’t combine personal information across them. And we’re committed to data liberation, so if you want to take your information elsewhere you can. We’ll continue to look for ways to make it simpler for you to understand and control how we use the information you entrust to us. We build Google for you, and we think these changes will make our services even better. Posted by Alma Whitten, director of privacy for products and engineering, Google. Editor's note: Earlier this week, we received a letter from Australian Privacy Commissioner Timothy Pilgrim on behalf of the Asia Pacific Privacy Authorities. We have responded with this letter.